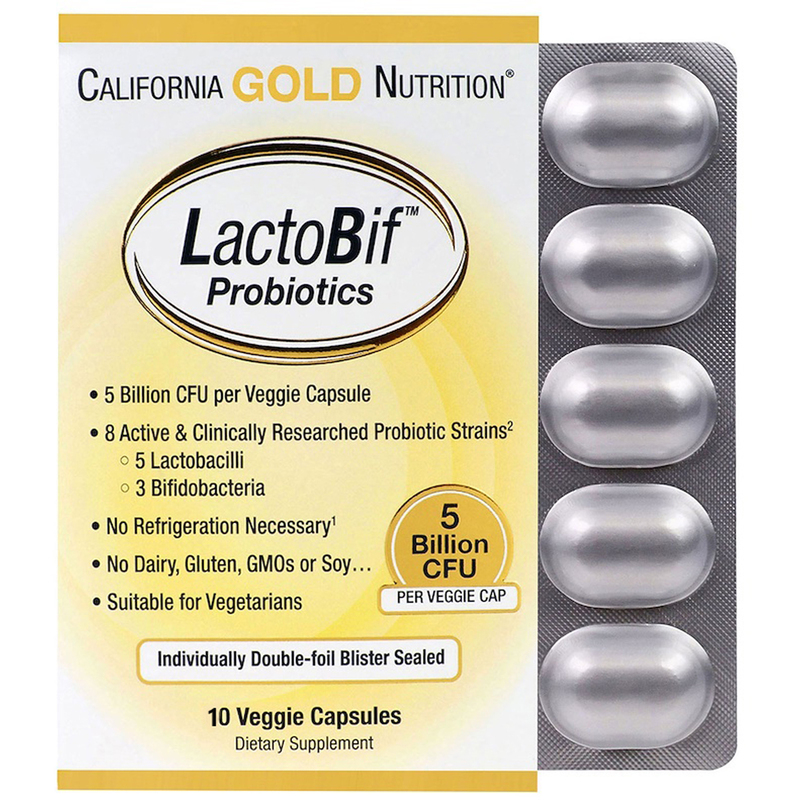 California Gold Nutrition Lactobif Probiotic formulas contain 8 active and clinically researched probiotic strains (5 Lactobacilli & 3 Bifidobacteria) exclusively using FloraFIT® Probiotics from Danisco®. Creating homemade fermented foods such as yogurt, kefir, kvass, etc is an art that requires specific probiotic culture starter products. Our LactoBif is not formulated to be used as a starter but LactoBif Probiotic capsules can be opened and the powder inside added to smoothies, shakes, etc. ¹In Vitro studies conducted by probiotic raw material supplier. 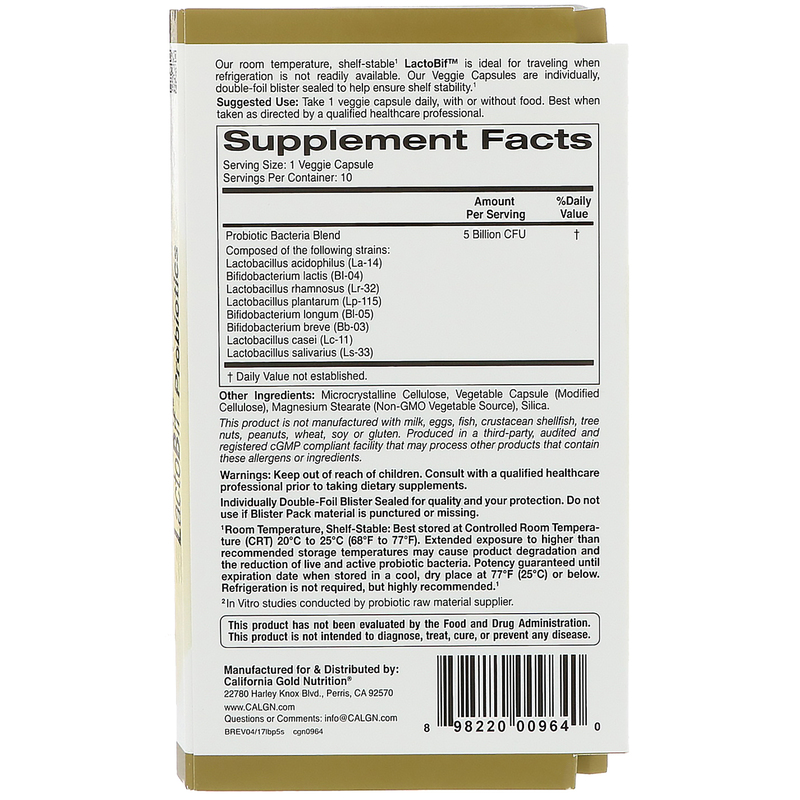 Take 1 veggie capsule daily or as directed by a qualified healthcare professional. May be taken with or without food. 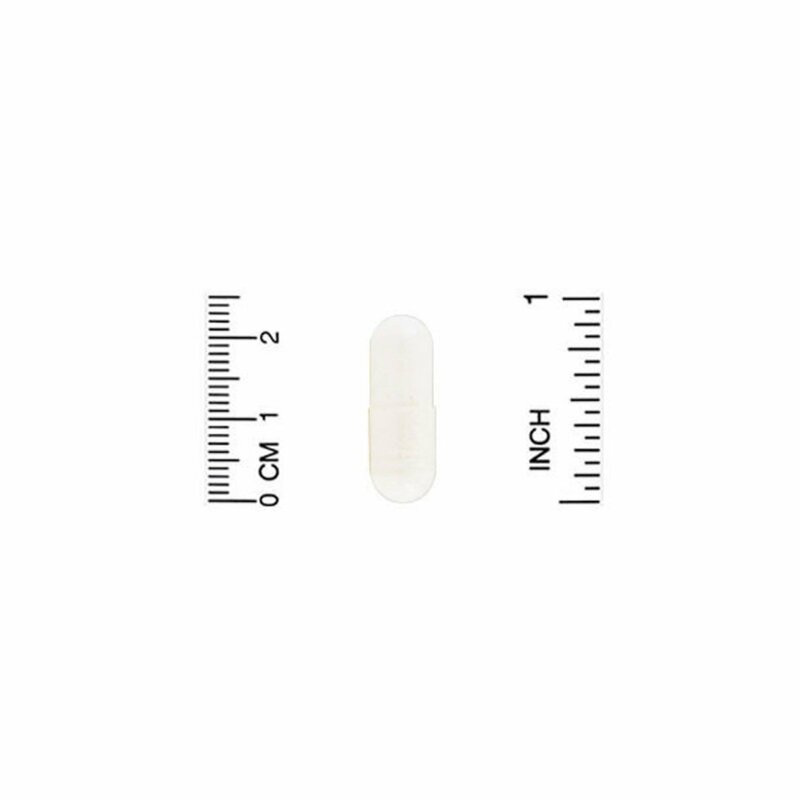 Microcrystalline cellulose, vegetable capsule (modified cellulose), magnesium stearate (non-GMO vegetable source), silica. Note: LactoBif products contain powder that is not 100% pure white and often has a yellow hue or yellow flecks because it contains many probiotic strains as well as other ingredients needed to encapsulate the powder blend. Not manufactured with milk, eggs, fish, crustacean shellfish, tree nuts, peanuts, wheat, soy, corn, gluten, salt, sugar or yeast. Produced in a cGMP compliant facility that processes other products containing these allergens or ingredients. Potency guaranteed until expiration date when stored in a cool, dry place at 77ºF (25ºC) or below. ²Room Temperature, Shelf-Stable: Best kept at or below 77ºF (25ºC). Refrigeration is not required, but highly recommended. Exposing probiotics to higher than recommended storage temperatures may cause product degradation and the reduction of live and active probiotic bacteria. Potency guaranteed until expiration date when stored in a cool, dry place, at 77ºF (25ºC) or below.